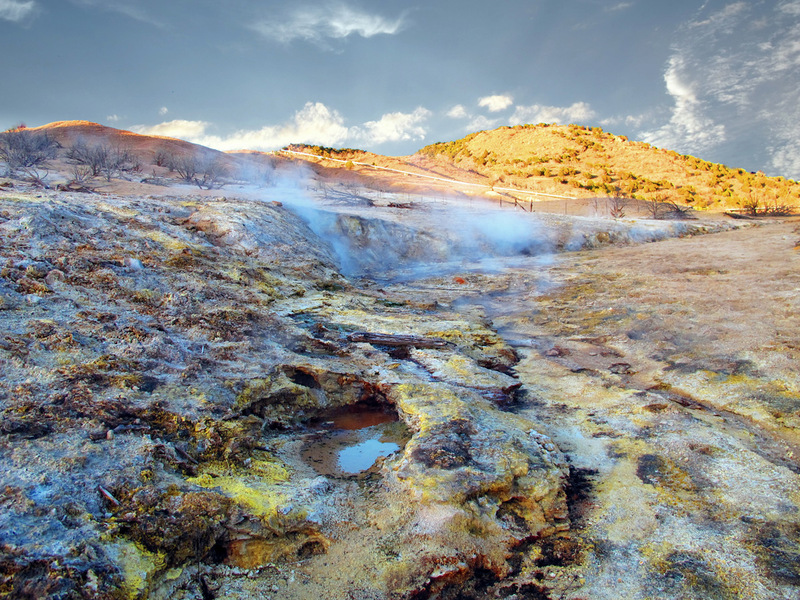 Bubbling pools and hissing steam vents are often vibrantly colored by yellow sulfur crystals and various colors of bacteria and algae. Roosevelt Hot Springs area. The Utah Geological Survey is an active participant in the National Geothermal Data System (NGDS). The NGDS is a DOE-funded distributed network of databases and data sites that collectively form a system for the acquisition, management and maintenance of geothermal and related data. Below are links to much of the data made available through the NGDS program. Main NGDS website containing news, updates, data, and resources. Active faults may indicate the occurrence of concealed geothermal systems. Links connect to UGS fault data used for the USGS Quaternary faults and fold database, as well as Utah’s Automated Geographic Reference Center (AGRC). Young volcanic vents and lava flows provide clues to the recent thermal history of an area and evidence for present-day geothermal history. Links connect to spatial data and reports on the recent volcanic history of Utah. Heat flow-related data includes: a new map of background heat flow generated from approximately 500 new and existing heat flow determinations; surface ground temperature established continuously across the state; and, a comprehensive thermal conductivity database compiled with more than 2300 measurements on Utah rock. Links to ArcGIS.com launch pages where users can choose to view GIS data in browser-based interactive maps or open the GIS data within ESRI’s ArcDesktop programs. Temperature data provides locations of thermal anomalies that might indicate new geothermal resources. Data pertains to about 285 hot springs in Utah. Temperature data provides locations of thermal anomalies that might indicate new geothermal resources. Data pertains to about 844 thermal wells in Utah. Thermal-gradient data are required for heat-flow determinations. Data in spreadsheets augment Southern Methodist University dataset for Utah. Includes temperature and gamma-ray logs for 84 wells plus e-logs, sonic logs and lithologic logs for some wells. DSTs provide the most reliable pressure, temperature, and mass-flow rate information for oil & gas reservoirs. Some oil & gas fields may be attractive for geothermal binary-power generation using co-produced fluid. Database of oil and gas well bottom-hole temperatures (BHT) and associated data throughout Utah obtained from geophysical log headers and corrected to estimate thermal equilibrium temperatures using various methods. This version of the data set represents 1130 corrected BHT measurements from 775 oil and gas wells throughout Utah. Additional geothermal-related data was gathered from May 2011 through May 2013. The data were obtained mainly from thermal-gradient drilling and sampling in various western Utah valleys with the majority of efforts focused on the collection of data from the Black Rock and Sevier Desert regions of Millard and Juab Counties. These data sets also include lithologic logs of wells, thermal conductivity data, chemical analyses of thermal water, geophysical logs of the wells drilled, and other geophysical data (magnetotelluric and gravity). Contains bibliographic citations of geothermal-related information for Utah representing about 1400 publications. The spreadsheet contains links to over 600 online sources.